Ateneo capped a Cinderella run by annexing its fourth women’s title - and the first in five years - with a 3-0 conquest of UP Friday at the Rizal Memorial Badminton Hall. 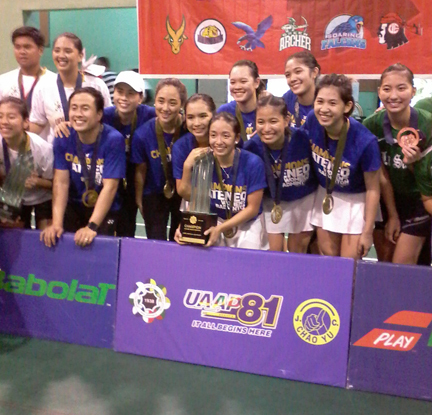 Members of Ateneo’s women’s badminton team display their championship trophy after ruling the UAAP Women’s Badminton Tournament. Chanelle Lunod took 79 minutes to beat Poca Alcala, 21-19, 14-21, 21-16, in the first singles before the Lady Eagles got the needed buffer after Samantha Ramos rallied from a set down to dispose Jessie Francisco, 16-21, 21-17, 21-16, in the second singles. Lunod and Geva de Vera, who late became co-tournament MVPs, dominated Leah Inlayo and Mary Ann Marañon, 21-13, 21-8, in the first doubles to seal the deal for Ateneo. Meanwhile, National University became the most successful men’s program in badminton after a 3-0 romp over University of the Philippines. The Bulldogs, who nipped the Fighting Maroons, 3-2, in last Wednesday’s Finals opener, completed their fifth straight perfect season, extending their streak to 43 ties dating back from 2014. “Maganda ang team bonding din namin. This is my final playing year so itinodo ko na para makuha ko yung goal na five-peat. Ang panalong ito ay para sa National University,” said Mike Minuluan, one of the five graduating players who claimed the season MVP honors. “Tulungan lang. Teamwork lang,” he added. Alvin Morada and Alem Palmares then sealed the title for the Bulldogs by prevailing over Betong Pineda and Harvey Tungul, 21-15, 21-17, in the first doubles. Among the graduating NU standouts who are part of this dynasty are Morada and Pedrosa, who were previous MVP winners.